The iPad is quickly becoming as important for creation as it is for consumption. It’s being used in countless ways, from planning and productivity to music and writing, which is why TNW’s Matthew Panzarino insists that tablets are PCs. The idea of writing songs and creating music on your iPad sounds magical, but sometimes the promise falls drastically short. Apps like Apple’s Garageband are fun to play with, but the process of playing a traditional instrument like a piano on a touchscreen is awkward in the best sense. The iPad needs instruments that were created just for this purpose, and experimental developers are stepping up. We already covered GRID, an app that lets you control a multi-touch sound visualization, and Thicket, an experimental app that allows anyone to create beautiful, abstract sounds and pictures. Now, I’m getting excited about a new iPad app called Orphion, which was recently discovered by the Creative Applications Network, the same team that curates openFramework’s gallery. The app comes across as a very unusual combination of a percussion and string instrument, and takes advantage of multi-touch gestures to replicate pressure sensitivity. 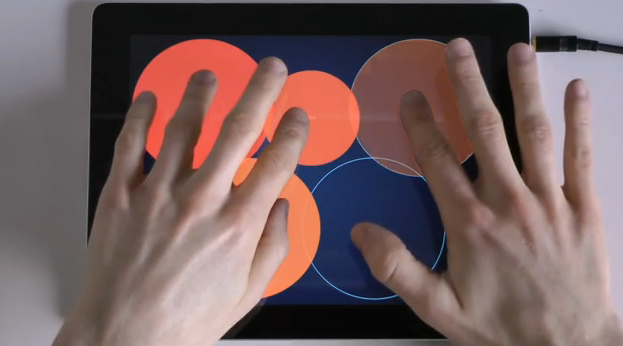 You can select scales and configurations, and play it by tapping and rubbing in a circular motion on the circles. As you can see in the demo video below, Orphion is very customizable and flexible — truly functioning as a full-fledged electronic instrument, rather than just an experiment. This sort of development makes me really excited about the future of music creation on tablet devices. There’s so much potential that has yet to be truly realized. Check out more of TNW’s favorite experimental apps here!